Flickering led lights effect - What causes led lights to flicker? 911 Electronic > Tutorials > Flickering led lights effect – What causes led lights to flicker? The intensity, the spectrum, and the flickering led lights effect the lighting parameters that most affect the comfort of its use. The phenomenon of LED flicker is a rapid change in the intensity of the diode. 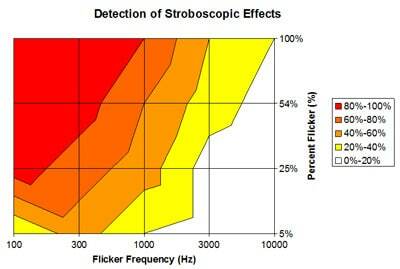 The human eye under normal conditions is unable to catch this phenomenon above 80 Hz for the illumination frequency, which is the limit for the LEDs. The phenomenon of flickering led lights effect, occurring over long periods of use leads to feelings of discomfort. There is a chance of developing various symptoms in a person like a migraine or seizures. Under typical industrial zone conditions, accidents can occur during work. The main reason for this is the incorrect perception of the speed of movement of other machine elements. The phenomenon of flickering led lights effect also can not occur during sports events or mass events, where video recorders record the image frequency more than the frequency of the LEDs. When driving, people focus on dynamic objects, in this case, light sources that blink. This creates hazards that can cause accidents on the road. The measurement of the flickering led lights effect value corresponds to the measured photodiode with the amplifier and the V-lambda filter, which adjusts the sensitivity of the system to the human eye. Creating such a measuring system is not easy. The main assumption of this measurement is the detection of a wide range of illumination reaching up to several thousand lux with the transfer of frequencies of the same value. The measuring path of this device must include an A/C converter with a resolution of 12 to 16 bits. In order for the whole to work together and to be processed, a program must be created that will record and determine the type of signal. The data that will be collected is inserted into time charts or in the frequency domain. The market is able to buy such a system for measuring flickering led lights effect. Typically, these are spectrometers with a function for measuring flickering led lights effect. As with any layout sometimes, the same measurement system we are able to build on their own. We need a correction photodiode, data acquisition, and software. The most convenient solution is portable devices for measuring the light flickering effect. They work well in both laboratory and field conditions. The most important fact that arises when measuring the led lights flicker effect of light is its frequency. In the case of traditional lightings such as halogen lamps, fluorescent lamps or incandescent lamps, the value of led lights flicker effect frequency is the doubling of the network frequency in which the lamp operates. However, this is not a certainty as most other led lights flicker effect are most often present. Fourier transforms are used to separate them. An important result of this measurement is the ability to see the graph and to know its shape. Where: A – value of the area under the run to the mean value, B – value of the area below the mean value. Where: Cm – the sum of transformer components, Tm – detection threshold of the corresponding frequency. 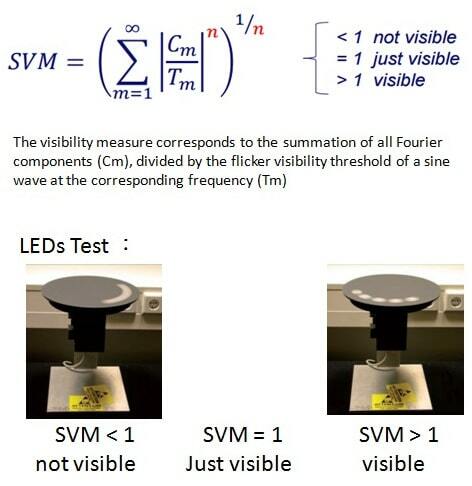 The three methods of measuring the flickering led effect value described above are used in actual measurements of light sources. There are also flickering led effect meters that serve to measure the short-term and long-term values of network voltages that are generated by the power changes of the receivers connected to the network. Safety values are specified in PN6100-4-15. They talk about network voltage measurement, eye-brain simulations and the use of old tungsten light sources. Choosing a power supply to a led source is not that simple. We need to determine what parameters are most important to us. These include, but are not limited to, the cost of manufacturing a lamp and its market use. A good solution in terms of powering the LEDs is a DC source that does not contain flickering effect. Frequent applications in power supplies are pulse inverters. 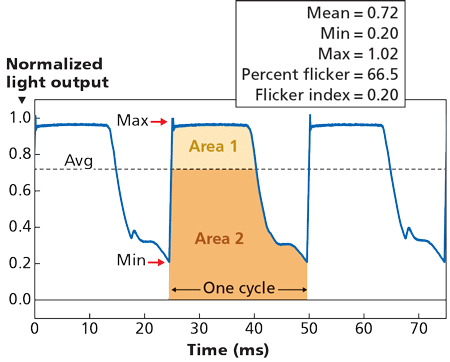 Which are not free from the flicker effect in LED. In some applications, designers give up filtering capacitors because they generate unwanted heat and take up valuable space. When using a capacitor in conjunction with AC/DC converters, they cause a decrease in power factor values, which is very important for customers. Power supply manufacturers choose between quality and price at the expense of decreasing power values and rising flickering effect. If you need to use dimmable led flicker technology with PWM technology, you need to set a high-frequency control frequency. A good example is LCD monitors in computers. Their frequency is in the range of 100 to 400 Hz. However, new research has shown that even up to 2 kHz can be seen by the human eye. 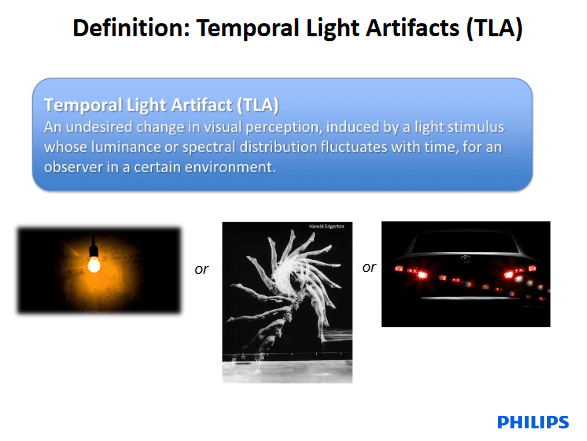 This is called the temporal light artifact (TLA). It involves the formation of images directly on the retina of the eye when moving and focusing on the PWM light source. The IEEE 1789-2015 standard states that PWM frequencies should be above 1.25 kHz of the low-risk level of 3 kHz for the NOEL model. 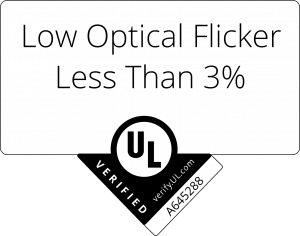 Good quality LED drivers with FP values of less than 1% and cheaper, budget LED light sources that are powered directly from the network to achieve similar values as fluorescent fluorescents, ranging from 30 to 40% FP. Quality LED lighting manufacturers are eager to take measurements of the brightness of their LED luminaires because of the desire to communicate this knowledge to their customers. Tests are performed under specified laboratory conditions. The measuring device is directed at a light source and is mounted on a fixed tripod. In order for the measurement to be correct, the light source must heat up to its operating temperature. This is conditioned by the current changes according to the operating temperature of the LED. If you want to measure several light sources, there is a problem with wave overlay or superposition. The best solution is the periodic control of the LEDs, which helps to maintain the quality of the LEDs and to determine the correct operation of the power supplies. Measuring devices are different because of their parameters such as sampling frequency, waveform frequency, resolution, and measurement time. Best quality measuring systems sample a supersonic signal 10x higher than the measured frequency, which has a positive effect on the shape of the waveform. During design, lighting is a factor of importance for us, the value of UGR. You should always require designers to provide this factor for the project to be performed reliably.